There's some slow progress in the elevator installation. The actual installation apparently goes quite quickly, as the elevator is a prefabricated unit that comes on site and is knocked together in a matter of a couple of days. Before that happens the contractor has to prepare the shaft, and that is what our contractor has been doing. At the bottom of the elevator shaft there is a drain that empties into the sump (see the next photo). 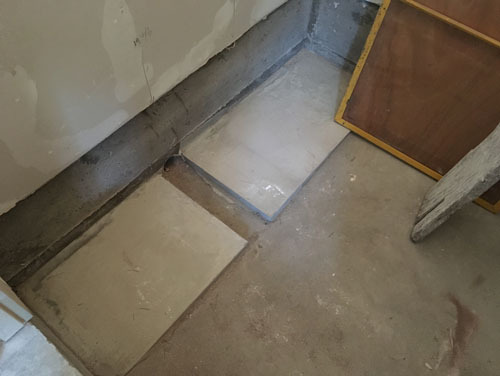 These little concrete pads just modify the sloped floor to make a level landing zone for the elevator cab. 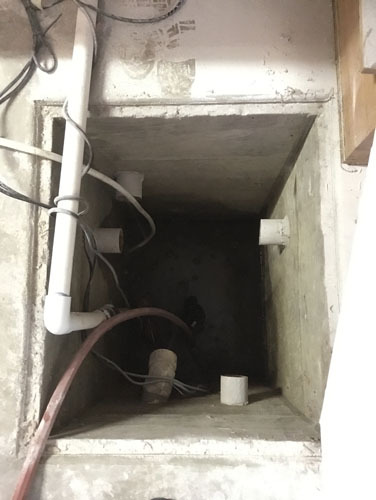 This drain isn't for any elevator function, by the way, but more in the way of insurance against some kind of water intrusion or burst pipe. It also means that if we screw up and let the sump fill up too much it will flood the bottom of the elevator shaft. In the sump, you can see that drain outlet on the right in this photo. With two sump pumps just dumping water into the street 24/7, we are finally back under control downstairs. We're in discussions of ways of building a system to handle this kind of year, even though the chances of ever seeing a year like this again are pretty low. Despite that, it's not going to hurt to be more prepared than we were this winter. Looking up in the shaft, you can see that the doors are all installed. One of them is off because the contractor is installing the interlocking wiring, which locks the door when there is no cab right outside it. The door will not open if the cab is not physically present. This is to keep you from plunging to your death or serious injury. Seems like a no-brainer but little things like this are what the building codes are all about. Speaking of building codes, one thing we have discussed with the general contractor recently is the 3x5 rule. This rules states that there can be no more than 3" of clearance between the inside face of the outer door and the cab gate. 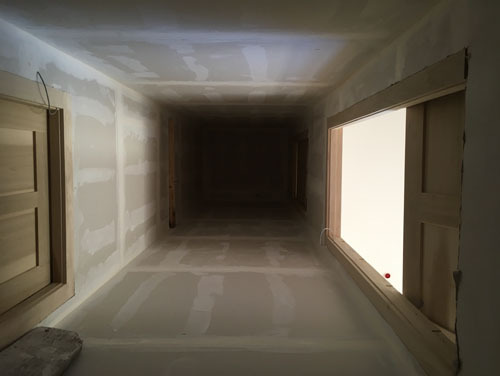 I was kind of puzzled by why this would be the case, because it is actually quite difficult to frame a door that far in in a wall of sufficient strength to be an elevator shaft wall. It is because -- wait for it -- little kids! Toddlers are basically responsible for 90 percent of the building code, it seems. They are like the drunk uncle we all have to work around. Anyway, the idea is that a small child can't fit into a space 3" or narrower and close the door. If the outer door can't close, the elevator cannot move (again, it's designed not to be able to move if the outer door is open). Parents of small children, you totally know this scenario: imagine that gap is more like 12" wide. You get in the elevator, and shut the outer door. You close the elevator gate, and hit the floor button. While you are doing this your kid opens the door and crams himself into the space between the elevator and the gate, crying that he needs candy, and lets the outer door shut behind him. Before you can do anything the elevator moves because the outer door is shut. You watch in horror as your kid is now standing on a narrow ledge over a drop to a concrete pit below. The outer door is locked and cannot be opened unless the elevator cab goes back to that landing, but do you trust that kid not to stick his head out and get decapitated? Will he not just fall by being kind of an idiot the way kids are? This is what the 3x5 rule is designed to avoid. The idea is that the space there is no wider than 3", so if your kid does open the door and step up to the elevator crying for candy, as kids are wont to do, the door won't shut behind him and the elevator cannot move until the other parents grabs him and duct-tapes him to the floor or, you know, talks him down or whatever thing parents do. No child is harmed, no parent has a heart attack in the elevator. Anyway, because of the way walls are framed and doors swing, meeting the 3x5 rule is kind of difficult without special framing around the door, so what contractors do, and what you can see in the above links, is that they build a little wooden box on the back of the door that fills the extra space and keeps the door from closing behind your troublesome children. You can use this box for hiding important documents or fill it with extra beans. Or leave it empty, if you are a dull sort of person. It looks like we are going to have to take that approach, and I'm kind of trying to decide what exciting things to put in our door boxes. Maybe this is where we can put our key rack. Unfortunately that rule is there for a reason. Until relatively recently we had a large number of pre-WWII birdcage lifts here in Vienna, some with retro-fitted controls from the 1950s. In one of these, there was a terrible accident. A little child somehow moved into the space between the inner and outer doors when the car door was already closed and the outer door fell shut, The instant it closed, the 1950s controls told the lift to go back to the ground floor and the child was squeezed to death. With the original controls, a parent would have had to send the lift back down by pushing a button on the outside of the car and would have noticed the child but the modernised "more comfortable" controls made that accident possible. I should probably mention that these lifts were only designed to carry people up to the desired floor and then go back down again empty and had no call buttons. That system made for extremely simple controls, mostly mechanical with very few electrical parts and no electronics at all. The new rules came into effect in 2012 and now there's probably no lift with original controls left in service, although some were even retro-fitted with thicker outer doors to keep the doors from closing with a child stuck in between. Some were completely restored with modern controls but most were just torn out. And a select few are just sitting empty, gathering dust and waiting for better days. Yes, when I got curious about why the rule existed I did some research and the kinds of accidents that can happen around the space between the doors in elevators are just horrifying. It's worth noting that almost every line of the building code is there because of death or horrible injury. The ones that are not are there because all people are created equal and have equal rights to anything intended for public use. People who don't have much experience with the codes like to complain about the red tape and somewhat tedious requirements, but they are all there to keep us alive and well. Also, it is simply astonishing the kinds of trouble kids can get into in even a very short time, even if you watch them like a hawk.